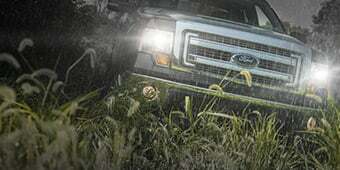 Please select options for Husky Custom Molded Front Mud Guards (15-19 F-150, Excluding Raptor) at the top of this page. What's going on, guys? Adam here with americanmuscle.com. Today I'm bringing you a quick overview and installation of the Husky Custom Molded Front Mud Guards, fitting all 2015 and newer F-150s. So in this video, of course we'll be going over the functionality and benefits of adding the Front Mud Guards from Husky as well as their materials and construction. I'll top the video off with the installation, which I'll let you know up front gets a very easy one out of three wrenches on our difficulty meter, but may require a slight amount of drilling, depending on your personal preference, which I'll touch on at the end of the video. 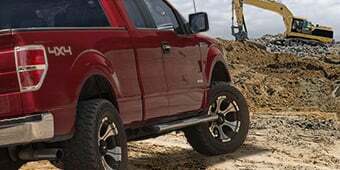 The Husky Custom Molded Front Mud Guards will be for any 2015 or newer F-150 owner looking to protect their body panels and factory paint from road debris, weather elements, and off-road messes by adding a custom-fit molding of a mud flap directly fit to their particular F-150. 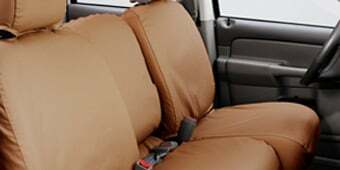 Now, if you've used Husky materials for the interior of your F-150 in the past, you know first-hand that they can do a hell of a job keeping out the weather elements from damaging the interior of your F-150. Now, that same logic and theory is going to apply to the exterior today with these custom-molded front mud guards. These will help keep your factory body panels and paint clear of any off-road debris, the on road debris, especially if you're taking it to a work site as a daily driver or doing some light off-roading. Speaking of off-roading, if you're hitting the trails with your buddies every other weekend or if you're doing it very, very often, doing some extreme off-roading adventures, you know first-hand that you can take on a lot of mud and dirt, which is honestly to be expected. What you don't wanna see is taking on some damage, thanks to those trail hazards, like kicking up small rocks, chipping your factory paint or leaving dents in your body panels. You can definitely prevent that by adding the Husky Custom Molded Front Mud Guards for a very, very minimal cost, which I'll talk about in just a second. Now, when talking about any protective materials or products on the market, you wanna see a very durable construction behind that. These are manufactured out of a rugged thermoplastic ABS material, something very durable and very common on the market for protective items and really after-market parts in general. This is something that will take the beating for your side panels and won't really chip or crack in the long run, something that offers a very durable material. On top of that, it has a matte black finish that is actually going to be paintable or ready to pop on your vehicle right out of the box. You wanna pop it on right out of the box, you get an aggressive look here, but you can definitely take it to a custom local paint shop to get it matched to your factory colors. These are going to be a very budget-friendly, affordable price tag, coming in at around $40. Now, in my personal opinion, this is something I would highly recommend picking up if you're doing that off-roading adventure stuff on the weekends, every so often, or extreme all the time or if you're taking your truck on the work site. 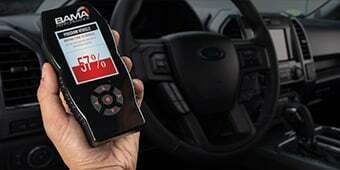 This is something you can definitely benefit from, and there's no hurt adding these to the front end of your truck. If you wanna pick up the rear end kit, it's just another $40 on that as well, something, in my opinion, is very worthwhile. Moving along to the install portion of the video, like I said in the very beginning, this one may require some drilling, depending on your personal preference. What that basically means is, if you're not looking to do any drilling, it does come with 3M automotive bonding tape pre-applied to the materials. All you'd have to do is clean the area off, peel off the backing of the tape, and stick it into place, which will definitely hold up. The 3M tape is something very durable, and it will last the test of time. But if you're looking for some added peace of mind, if you want some added safety and security, there are pre-drilled holes in the materials, which you can do some drilling into your wheel wells just to get it to stick on there a lot longer as a more permanent option. Overall, about 20 to 30 minutes on the install with the 3M tape, maybe 30 minutes to an hour if you're doing some drilling, and either way, it gets the one out of three wrenches on our difficulty meter. Wrapping things up here, if you're the owner of a 2015 or newer F-150 and you're looking to protect your body panels and factory paint from taking on damage from your daily work commute, your off-roading adventures, or just some weather elements, you might wanna check out the Husky Custom Molded Front Mud Guards, of course available right here at americanmuscle.com. Add Protection. 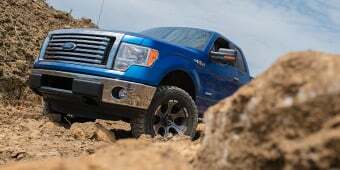 Keep your F-150 looking showroom perfect with a set of Husky Front Mud Flaps. Flying rocks and debris can do a number on your truck's paint, but a set of Husky Mud Flaps will keep them down on the ground or asphalt - where they belong - and off your rig. 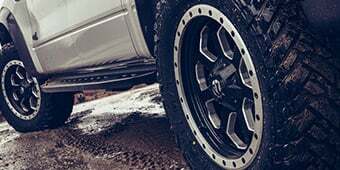 So keep your truck's finish worthy of braggin' rights no matter how far off the beaten path you're going with a set of these heavy duty mud flaps. Application. This pair of black Husky Custom Molded Front Mud Flaps is designed for 2015-2019 F-150s, excluding Raptors, with or without OE fender flares. what is OE FENDER FLARES? OE Fender Flares refers to if you have no added fender flares to your truck. The OE flares and Aftermarket flares have different attachment points so you will need to verify which you have before finalizing your purchase. How do I know if I have Fender flares? I do not have the plastic, black flares, but i believe there is an extra piece of moulding around each wheel frame. 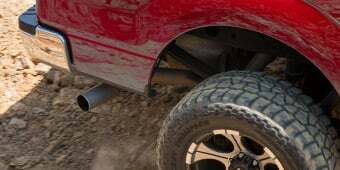 As long as you do not have aftermarket fender flares, these husky custom molded mud flaps are designed for 2015-2017 F-150s, excluding Raptors, with or without OE fender flares. I like that the mud flaps fit Ike they are factory accessories. Could have installed the no drill what, but chose to go the extra step and use the included screws and washers. Look great. they fit perfect and made my truck look sporty, i love the black with the white truck. Front mudflaps are somewhat rare so it adds a unique cut for the front end of my truck. I paired these with the husky rear wheel well covers for ultimate protection. They fit great and were pretty easy to get on. I bought these because when I was in Wyoming hunting antelope the sticky clay from the road was building up on the running boards. Every time I would open the door it would rub on the pile on mud on the running board. I put these on and took the truck bear hunting in Minnesota. 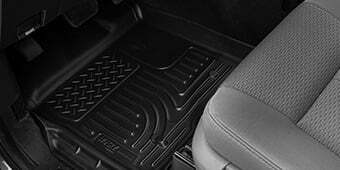 With wet roads, no build up on the running boards. Great product, easy to install. 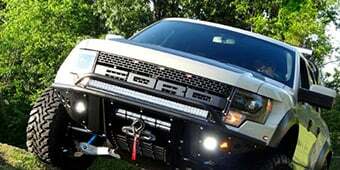 Look good, easy to put on , good on camp stone Dr.
Works as a cheap mud flap should and looks as a cheap mud flap should. All said, worth the money. I chose these as they are rounded off and don't have the old "papaw" look of other brands. These were installed on a 2015 F150 XLT SPORT with Factory OE Fender "Flares" - like the maroon truck on the AM demo truck. 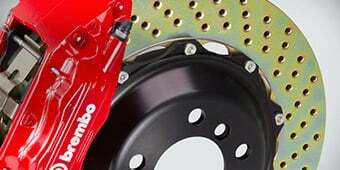 They are molded perfect to the contour of the truck and flare. The install utilizes the factory bottom bold and has indents in the mud flap for optional included factory type screws with washers. I chose to spend a minute and put one screw at the top indent, which required a 1/8 in bit to drill threw the factory flare and into the aluminum fender. Again not required but I like things tight and secured. Not a fan of the stories I have heard about the other brands advertising no drill, flying off when packed with mud or snow. With the molded bends and secure fasten, these should pass the test of time!